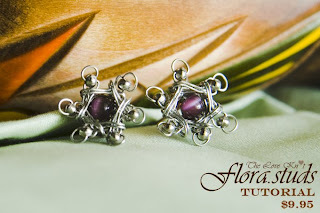 Tutorial-DCH005: The Love Knot, Flora.Studs. Another Chinese Knot has been incorporated into Wired Jewelry form, same as any other Chinese Knottings, I am pleased to introduce you another knotting that has unlimited potentials in Wire Jewelry Making – let your imagination run wild and you shall see the amazing outcome. There are 4 major steps in making this pair of stud-earrings, to deliver the clearest instruction, the beautifully taken 96 pictures (including the coverpage) will provide you the means from end to end to make this precious piece. In this document, it also listed out the tools and materials being used. You can create the earrings by just looking at those high-resolutions pictures.